Lampwork by JillSymons.com glass artist. 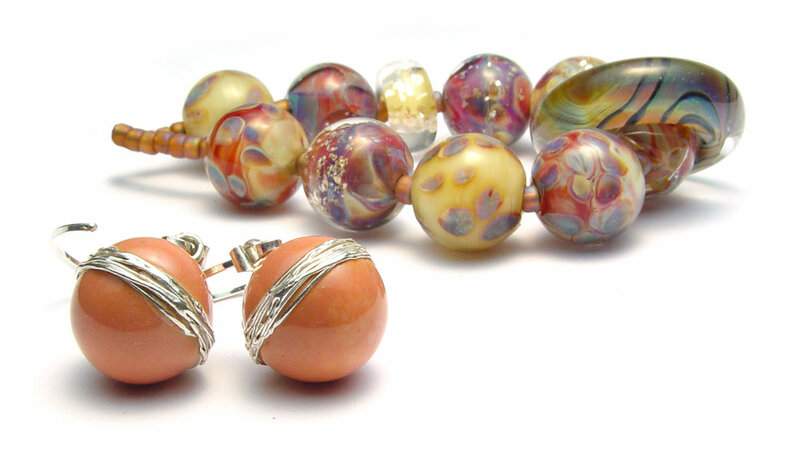 Focals and paired sets, elegant sophisticated artisanal lampwork. Finished pieces, loose beads, matching earring pairs. 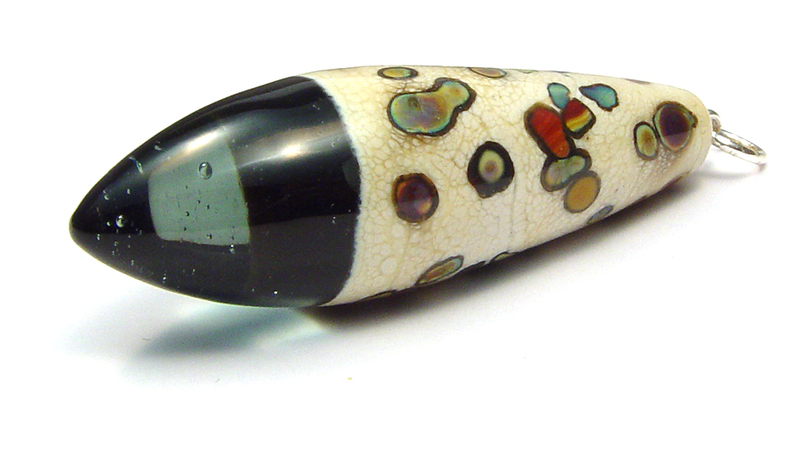 Sleek, contemporary glass beads. flat back pendant with a wrap of purple, magenta over black… with raised dots on base of pistachio… with a drop of jet black. Encased trio - Straight edged focal, and matching pair of earring beads. 58mm long, denim blue veiled over clear to make the color less dense… deeply capped with ivory - and random islands of color. I love springtime - and this focal seems like a nice segue there! One hole only - with a permanent bail of sterling set in place - ready to wear!! This focal measures 58mm from top to tip. 33mm L x 20mm dia at base, 1/16 mandrel hole. So - Tassels are in… this is a glass version of that thought. Some of my favorite colors and shapes - into an elongated pendant that has such nice movement. Overall this beauty measures 98mm… (just shy of 4”) it comes ready to be slipped onto a nice long chain or be woven into your dreams. Party banner earring toppers… with tapering black “tassels”. Overall these measure 72mm from top to tip. (2 3/4”) All findings are sterling silver and have been permanently set in place. How you want it… naturally a big puddle of clear glass amplifies what’s underneath. I’m showing this set two ways… amplified and colorful - and in the lower right - raised dots - your set - your choice. I have given you a dozen 3/8” purple spacers - eight of them are wound over a core of clear to make the color less dense… four are solid purple color. The dots of purple on the main part have a range of saturation so - this works! This set measures 7“ as strung, with 1/16” mandrel holes. I received an email last week with a shot of the surface of Jupiter… it was beautiful. This reminded me of what it must be like to have the stark contrast of a colorful surface showcased against the dark of the universe. Elegant shape, counterbalanced by the wild top! 43mm long top to tip. More color merging… This truncated bicone has a series of feathered waves of color capped with small black dots it’s graceful, elegant, and has a sense of power… (? )… 3/32” mandrel hole, 48mm long from top to tip. I love this pendant. It’s graceful, sized nicely, half domed to alleviate too much weight and it’s just perfect. The findings are sterling and are already in place - just add a chain and off you go!